This one came stock with a vanguard so no swapping required. Right now it has the original pedal start and it works but somebody cut the key switch out of it. I'm trying to decide if i want to fix it back to stock or wire it so that it's key start and idles when the pedal is not depressed. Anybody have any experience or advice? Here's a picture. It could maybe use a bath. I love my pedal start, but I use the cart for all kinds of things. Pedal start you can jump on and off so fast. For a trail ride cart maybe you want key start, but my pedal still works fine so I don't know. You can like said put a bypass switch on the pedal so it keeps running, then use the key to turn it on/off for those long rides I guess. I just don't care if the engine stops when I do, I set it to idle and I setup the pedal with 1" play to idle. So if I have foot on pedal it idles no problem, for those times I will not stop for long. But its up to your preference and what you will use the cart for. 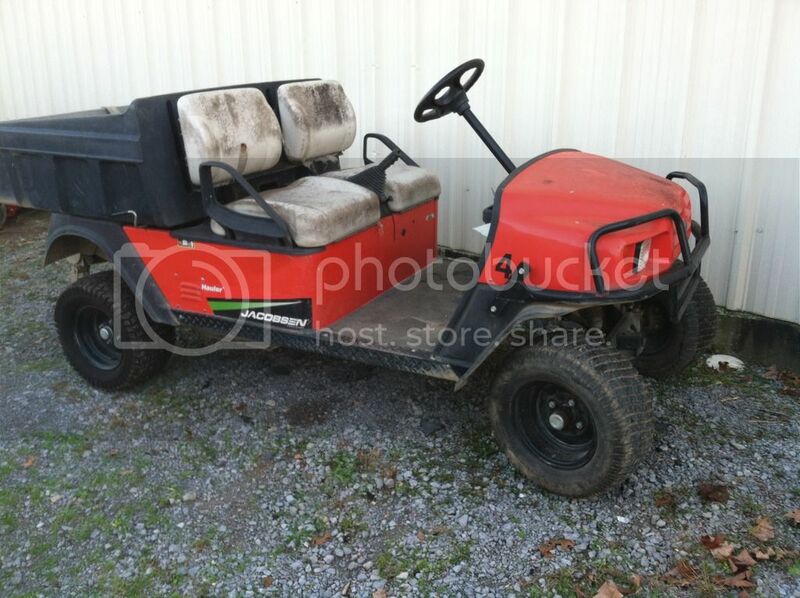 For a trail cart I might set it up with a key. This cart others use it local, I use it for yard work, its nicer to have the pedal. The gen is made to start it a lot so its not a big deal to the cart. I HATE pedal start! I use mine on the trails so I converted it to key start and couldnt be happier. If your going through the woods at a slow pace it would drive me nuts for th ecart to shut off everytime I come to a stop. On my G9 I did have to remove the pedal and move it up the splines so it has more travel. That way it goes down an inch then the throttle starts to work (on carb) and it gets WOT on the floor. This makes it much easier to idle it with your foot with the 1 inch between start switch and beginning of throttle movement. I thought of putting a bypass on the pedal but just not important enough to bother with I guess. Can say one of my first jobs involved a lot of cart use, so I've always been used to the auto starting of a cart while some people find it odd. I do use the cart a lot for short trips. I can be up to 50yrd down the drive before a friend starts their utv and gets it in gear and starts moving lol, and I like that. In the end go with the setup that is best for you and your use. One issue is if you keep the gen or not, if you keep it then it is easiest to put a bypass on the pedal. If you don't then you can't have auto starting. If you run a clone most don't have charging so you need the gen or an alternator, unless you specifically got one with the 18A like the lifan. I was a golf course superintendent for a long time and always liked the jump in and go of the pedal start. If I leave it stock I think it would be fine. If I build this motor a little would it I notice a difference? I guess I'm thinking back to the stock carryall's we used to drive. You got in and floored it and it started, and then slowly accelerated to top speed. Will it start and accelerate hard right off the bat like a cart that is setting there idling will when you floor it? I like my key start on both my golf cart and the UTV (PUG) that I got from my dad when he passed away. I never cared much for the pedal start even on my cart when it was stock. Don't really know why but didn't. Although it means shutting off the golf cart when I want to shift from forward to reverse now with the clutch I have in it. But that is a small price. I'll have to look at my videos, mine is started and up to shift rpm in less than 2 seconds. This is with stock clutches, umax spring, cut secondary sheave. The stock primary shifts kind of slow but even with that it gets rpm fairly quickly. With my 94c its quicker to rev, a better clutch would be better yet. I don't know if I did a dead start, but its pedal start and starts instantly when warm. You have to set the idle mix and idle to get that. When it idles I have my foot on the pedal, I have 1" freeplay to idle it. Idle is slow so I can shift as shown. This is the first clone I put in, he hit the gas before I was ready but I floored it when he was even with my front bumper. He still pulls way ahead of me. Its the only comparison I got with a clone and stock cart, same carts, same stock clutches, same tires even. I don't even recall if the clone was jetted all the way. I wanted to get a video of that against the built up clone I run now, still with stock cam/block. But I could never get some one to drive the other cart when I had time to video.